How do you fix rust damage on a car? 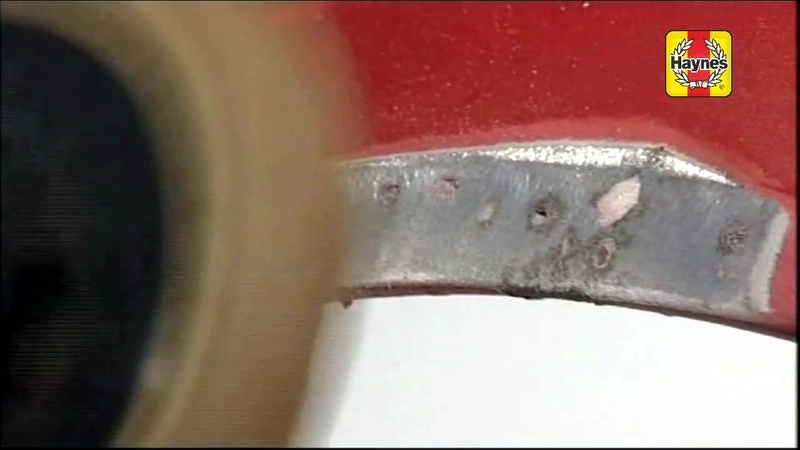 Cars and trucks today are much less rust prone than they were just 20 years ago, but if you live near the ocean or drive in an area that uses salt on the roads, you can still get rust through long before the mechanical parts are worn out. Minor rust damage on non-structural parts of the car, like these bubbles on the rear fender of our Ford Ranger, can be easily repaired and with a little practice even made to look like they never happened. Professionals restoring classic cars usually use a method of cutting out the damage and welding in new material, but for a daily driver fiberglass epoxy and a little body filler makes things much easier. 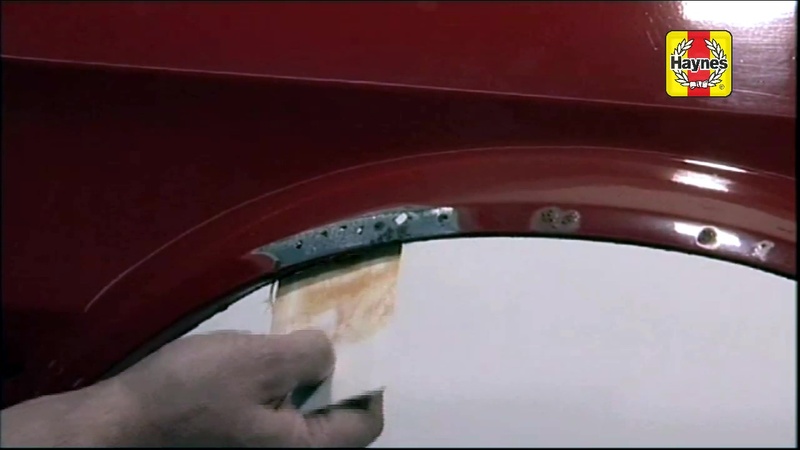 In past Tips and Tutorials we've talked about fixing a deep scratch in your car's paint, and pulling out dents and dings with a stud welder, but what if the scratch or dent has progressed to the point of rust through? Most rust through damage starts out with something as simple as a chip from a piece of flying gravel, or a door ding that cracks the paint, which is why it is so important to give your car a wash and a once over periodically. A spot of touch-up paint now may take a few minutes and save hours of rust repair ten years from now. Read on for step by step instructions, or check out our YouTube video tutorial. 1) Remove Paint and Rust - Use an angle grinder with flapper wheel to remove the old rust and paint from the surface to be repaired. It is possible to accomplish the same thing by hand with coarse 80 grit sandpaper and a wire brush, but it is much harder to do a thorough job. For an area where you can't reach the back with the grinder, use the wire brush to remove as much dirt, grime, and rust as you can. You may want to use a rust converter, specifically made for hard to get areas, which goes beyond paint to chemically neutralize rust and leave a protective black coating. 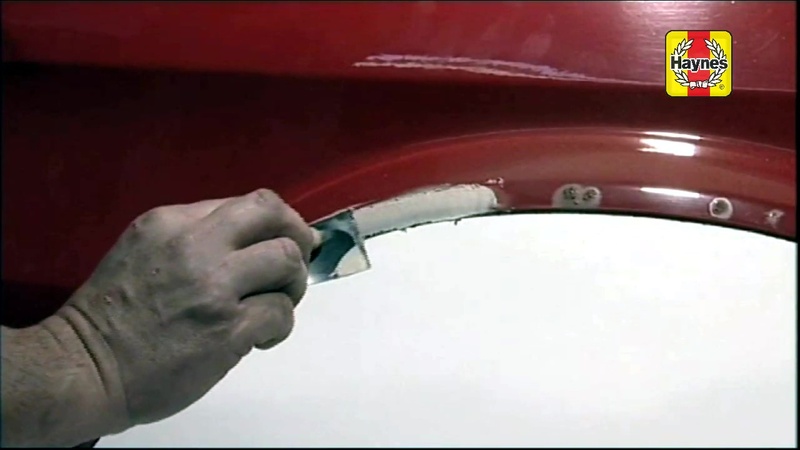 2) Repair with fiberglass - Long strand fiberglass repair gel, unlike body filler, creates a structural repair that is nearly as strong as steel. Mix the gel and hardener, and press into the damaged area from behind. Check with the package, but it typically starts to harden in about 15 minutes and can be sanded in less than an hour. 3) Sand excess fiberglass - Use the angle grinder and flapper wheel to sand off any fiberglass gel that has been pushed out through the rust holes. 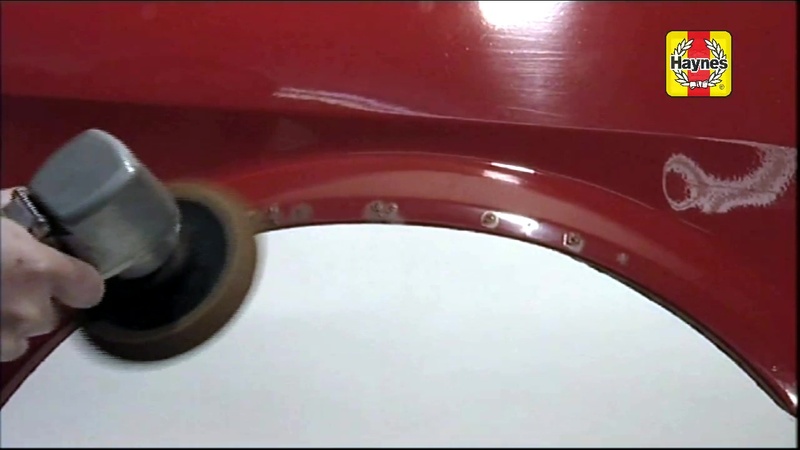 The surface of the hole should be slightly recessed compared to the metal body panel so that it can be filled with the smoother body filler. 4) Apply body filler - Mix the body filler with the proper amount of hardener. Apply body filler with a flexible, flat spreader, pressing it into the rust holes. The flatter you can get the filler while applying it, the less sanding you will have to do afterward. Be certain to apply enough filler so that there are no low spots, pinholes, or scratches that will have to be filled in with a second coat. 5) Sand it smooth - The most important and most time-consuming part of body work is getting a smooth surface before you start applying paint. Start with 400 or coarser grit sandpaper and sand off any excess body filler; it sands faster if it is not quite fully hard. If sanding a large area, you may need a sanding block to make sure you don't end up with a wavy surface. You are done when the entire area has been sanded smooth to the touch with 400 grade paper. 6) Clean area - Wipe the area you just repaired with a clean rag and mineral spirits to remove any residual dirt or oil from your fingers. The body filler should be so thin you can see metal and paint through it in most places. Let dry, then wipe once again with a tack cloth to remove any lint. Any fingerprint, smudge of oil, or spec of dust will cause spots, fisheyes, or runs in your paint, so cleanliness is crucial from here on out. 7) Apply primer - Spay primer over the repaired area, any bare metal, and at least an inch around it to allow for blending. For best results, spray over the entire area in a thin coat, then go over again a few minutes later with a slightly heavier coat. Let the primer dry the recommended amount of time before sanding. 8) Wet sand and repeat - Wet sand the newly primed area with 400 grit sandpaper until it is smooth and the edges of the repair are feathered into the original paint. Wipe clean, allow to dry, and spray another coat of primer. Move to a higher grade of sandpaper, 600, and wet sand and prime again. 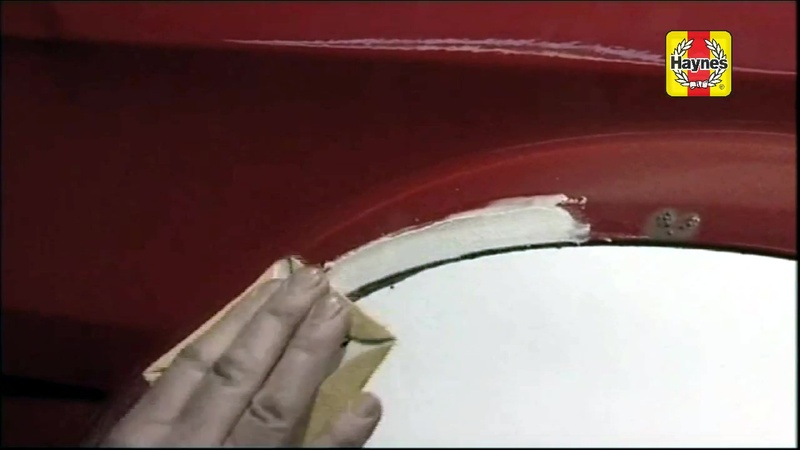 Two or three coats of primer are typically enough to get a reasonably smooth repair. 9) Spay the base coat - Most cars these days use a base coat (the color paint) covered with a protective top coat (a thicker clear paint), but many touch-up paints can be applied alone without the clear. Spray two or three thin coats of paint over the primer and repaired area, and up into the original paint. 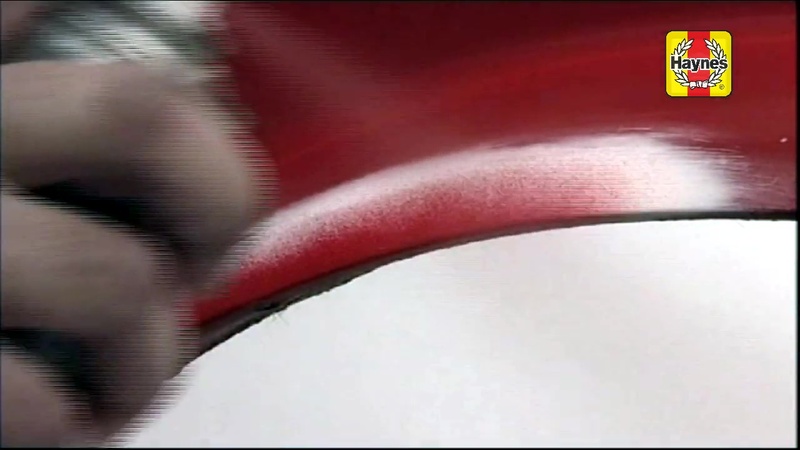 Several thin coats are better than one thick coat because it avoids leaving runs or drips in the paint. 10) Rub out the paint - In order to get the full glossy finish from spray can touch-up paint you need to run it by hand with a rubbing or polishing compound, and if you have any significant mistakes (orange peel, runs, drips), you will need to start with wet sanding. Wet sanding with 1000 and then 2000 grit should allow you to remove runs and orange peel, or you may have to go even coarser, but go too far, and you will have to spray another coat of paint. 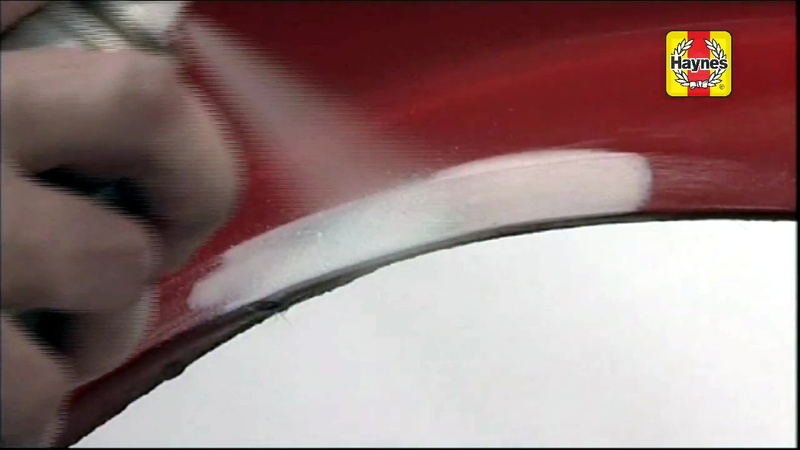 Polish lightly with rubbing compound, then move up to a finer polishing compound, and you should achieve full gloss. 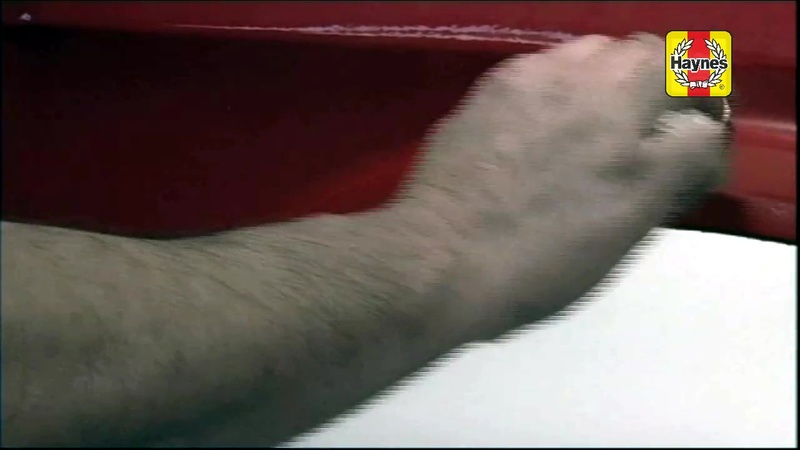 The rubbing will also allow you to blend the new paint of the repair into the original paint around the edges. 11) Spray the clear coat (optional) - A clear coat is optional for most minor repairs, but the advent of 2K clear paint in a spray can has made it a good idea if you plan on keeping the car. 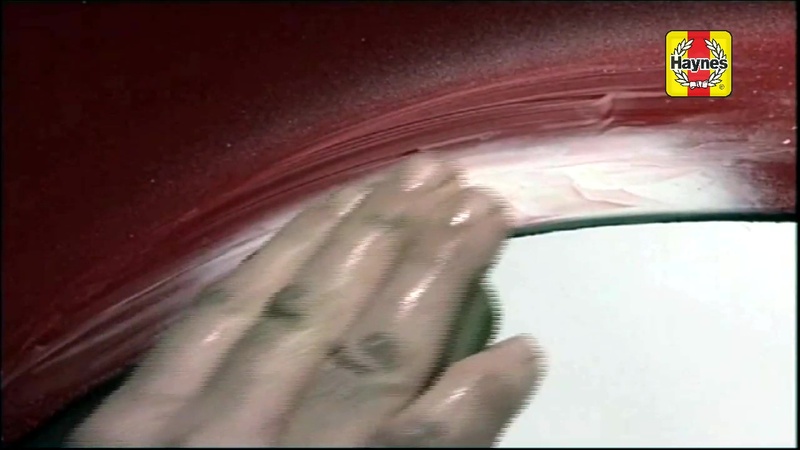 The original factory paint uses a two part mixture with paint and an activator or hardener, making the paint like an epoxy that is impervious to weather, UV light, and solvents. Two part, or 2K, spray paint will make your home repair nearly as durable as a professional body shop paint job, and much longer lasting than touch-up paint alone. We shot a companion rust repair how-to video that quickly and concisely demostrates just how easy repairing rust in this way can be. If you find that video helpful, subscribe to the Haynes YouTube Channel and get more helpful hints, how-tos, and previews of new products.